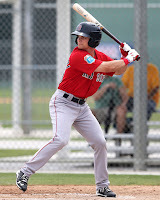 4/30 Cup of Coffee: Another night, another dynamic performance from fourth-ranked prospect Andrew Benintendi (pictured), whose four RBI carried High-A Salem to a 4-3 victory. The rest of the affiliates did not fare as well. Pawtucket coughed up a one-run lead in the ninth of a 3-2 loss while Portland and Greenville generated little offense in defeats. Right-handed relief pitcher Carson Smith saw his first action of 2016, rehabbing with the Sea Dogs. Noe Ramirez was hung with the blown save but it was sloppy defense that felled the PawSox in a ninth-inning meltdown. Leading 2-1 entering the bottom of the final frame, the PawSox committed three errors — charged to first baseman Sam Travis, catcher Blake Swihart, and shortstop Deven Marrero — which brought home two runs for a Syracuse walk-off win. The late rally wasted a strong start from Brian Johnson, who allowed just one run and struck out six in 5 2/3 innings. The PawSox grabbed an early lead on a solo shot by Ryan LaMarre, his first of the season. Swihart picked up an RBI single as part of his 2-for-4 night, and Marrero had two singles out of the leadoff spot. 4/29 Cup of Coffee: It was a night light on games, but not on intrigue as Eduardo Rodriguez began his rehab stint with Pawtucket and Trey Ball made his 2016 debut for Salem. 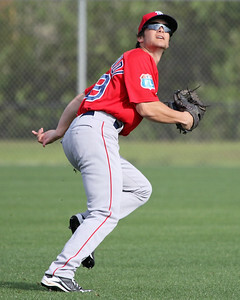 But it was Andrew Benintendi (pictured) once again coming up big in a comeback win for the High-A Red Sox. 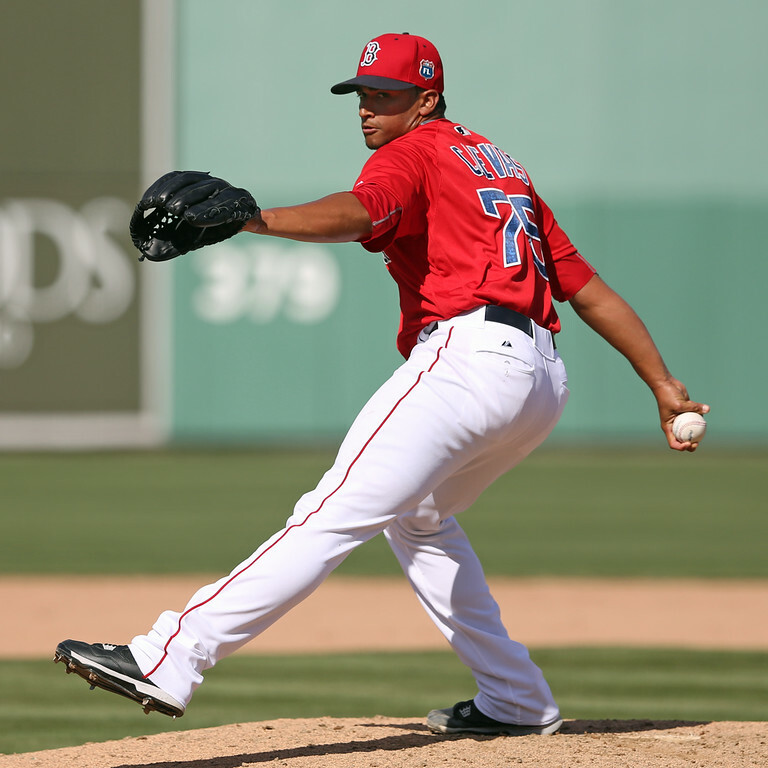 It was a rocky start to 2016 for Eduardo Rodriguez who made his first rehab start for the PawSox. The 23-year-old Venezuelan threw 75 pitches, lasting just 3 2/3 innings. He gave up three runs (two earned) on six hits, walking three and striking out two. According to multiple reports on Twitter, Rodriguez will have at least one more rehab start - possibly two - before rejoining the Boston rotation. 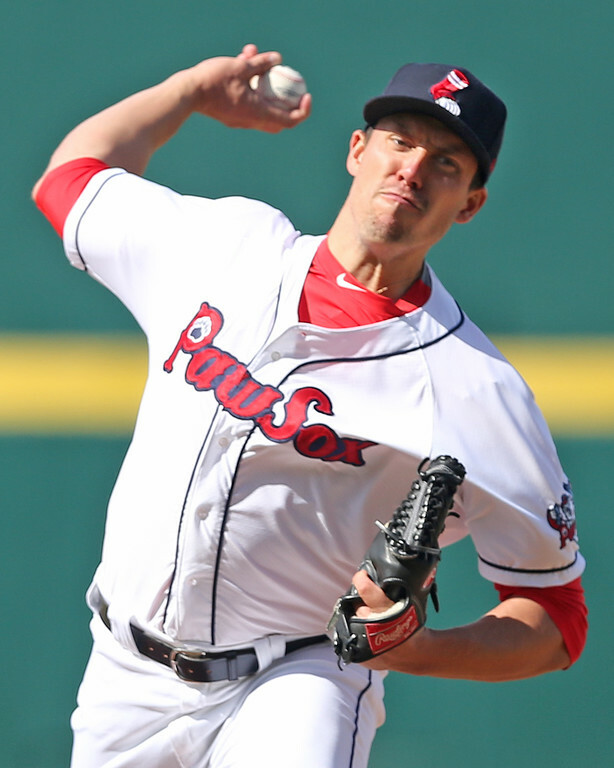 Keith Couch threw 3 1/3 innings of scoreless relief to keep the PawSox within striking distance, but the bats went cold. 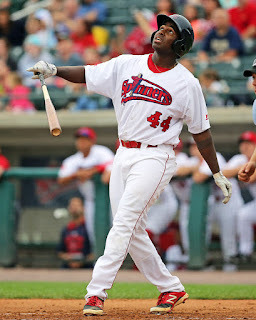 Rusney Castillo drove in Pawtucket's only run with a sacrifice fly in the eighth. A third inning rally was snuffed out when Ryan LaMarre was gunned down at the plate trying to score. Blake Swihart and Sam Travis were both held hitless. The former also played his first game in the outfield as a professional, starting in left field. On occasion, we will be featuring videos here from the SoxProspects YouTube page. 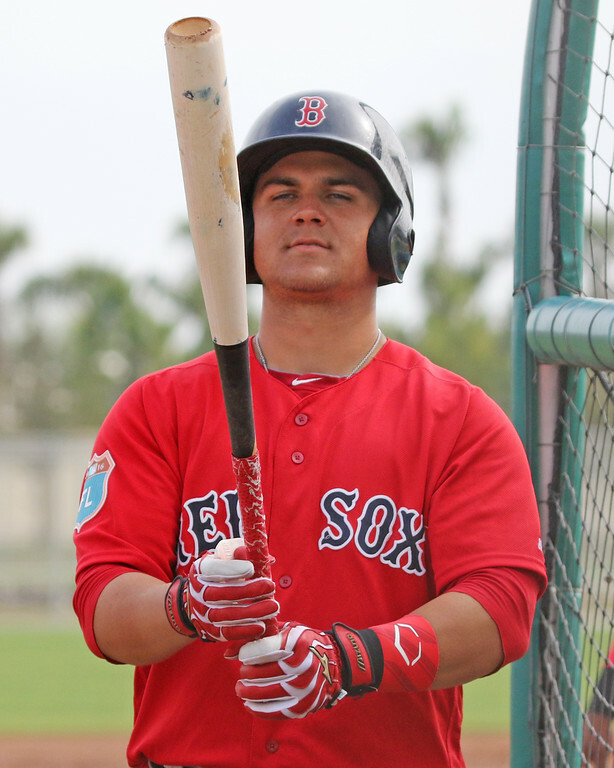 Today's video is of 2014 first-round pick Michael Chavis. Watch the 20-year-old hit in spring training games last month and take grounders at third. Our scouting staff went into more detail with what they saw from him down there, and Chavis also described how he lost weight over the offseason in another SoxProspects.com story from spring. Chavis was off to a scolding start to start the season with Greenville, but was recently placed on the disabled list with a thumb injury. This season, we plan to incorporate more video to supplement our regular scouting material, so check back here and on the YouTube page frequently. 4/27 Cup of Coffee: The major league club used up all of the offensive firepower available on Tuesday night. While Boston pounded out 11 runs in its rout of Atlanta, the three affiliates in action combined for only four. While the bats fell mostly silent, Andrew Benintendi and Yoan Moncada continued their superlative runs, each extending hitting streaks to 15 games. The weather is often Pawtucket's toughest April opponent. This year, Mother Nature intervened in McCoy Stadium's first and last game of the month, but allowed all in between to go off without a hitch. Tuesday's rainout will be made up on June 21 as part of a doubleheader. The two teams have an off day Wednesday before kicking off a four-game set in Syracuse. 4/26 Cup of Coffee: William Cuevas (pictured) was dominant over seven innings for the PawSox, with Blake Swihart, Sam Travis, and Marco Hernandez providing all the offense he needed. Kevin McAvoy was not as successful in Portland as he struggled mightily to throw strikes, ending the day with more walks than outs recorded. Both Salem and Greenville were off yesterday. Fresh off his major league debut, William Cuevas led the PawSox to a shutout victory. Cuevas went the first seven innings, allowing only three hits while walking three and striking out four. After struggling in his first appearance in Boston last week, Cuevas was able to get back on track and turn in his best start of the young season. Kyle Martin finished off the shutout with two scoreless innings, striking out four and allowing only one baserunner. While his 5.40 ERA is not pretty, Martin has not issued a walk and has struck out 11 batters over his first 10 innings. UPDATE: Speier has rescinded the report upon which this post was based, citing a misunderstanding with his source. 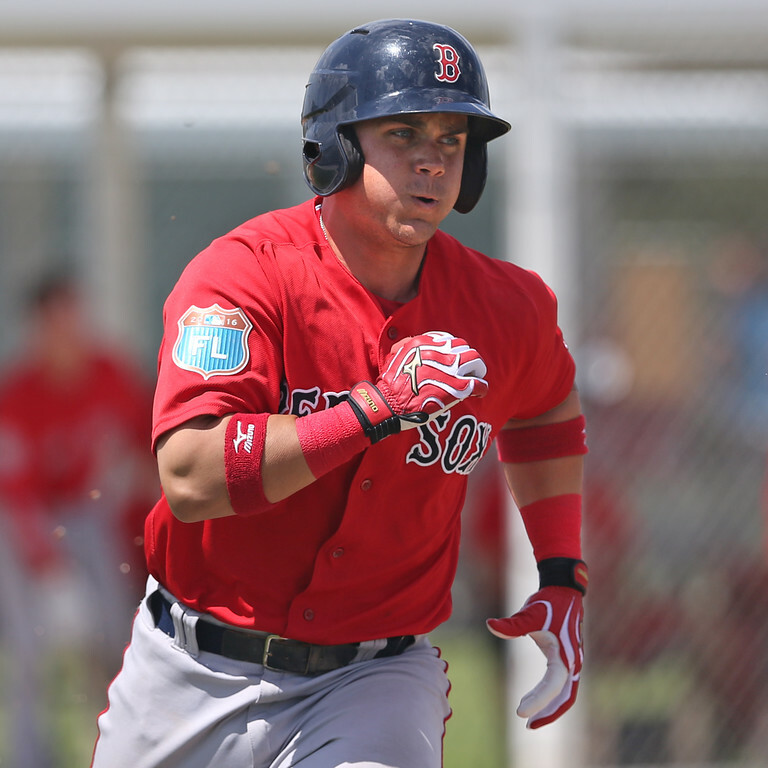 Per the Boston Globe's Alex Speier, third baseman Michael Chavis (pictured), who is ranked 11th in the SoxProspects.com rankings, has torn a ligament in his thumb. The injury occurred Saturday night in Greenville's loss to the Columbia Fireflies, when Chavis left after just two at-bats. Chavis will undergo an MRI to determine whether or not he will need surgery. The Red Sox made Chavis their first-round draft pick in 2014. Chavis played all of last season in Low-A Greenville, slashing just .223/.277/.405 and striking out at a 30.6% rate. However, he did lead Red Sox minor leaguers with 16 home runs and his isolated power of .182 was impressive for a 19-year old in his first taste of full-season ball. It was a busy week for call-ups to the majors as the Red Sox dealt with injuries and a fatigued bullpen. 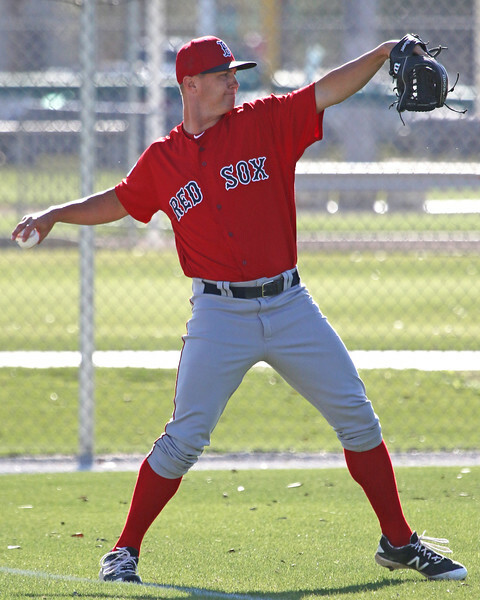 Henry Owens got the start on Sunday (lasting just 3 1/3 innings), Noe Ramirez returned to big league action, Marco Hernandez was sent back down to Pawtucket and Pat Light and William Cuevas (pictured) got their first-ever call-up to the majors. In the latest SoxProspects.com Featured Video, Salem third baseman and second-ranked prospect, Rafael Devers, gets the spotlight. The video was taken during batting practice in spring training. Devers wasn't the only one highlighted this week. 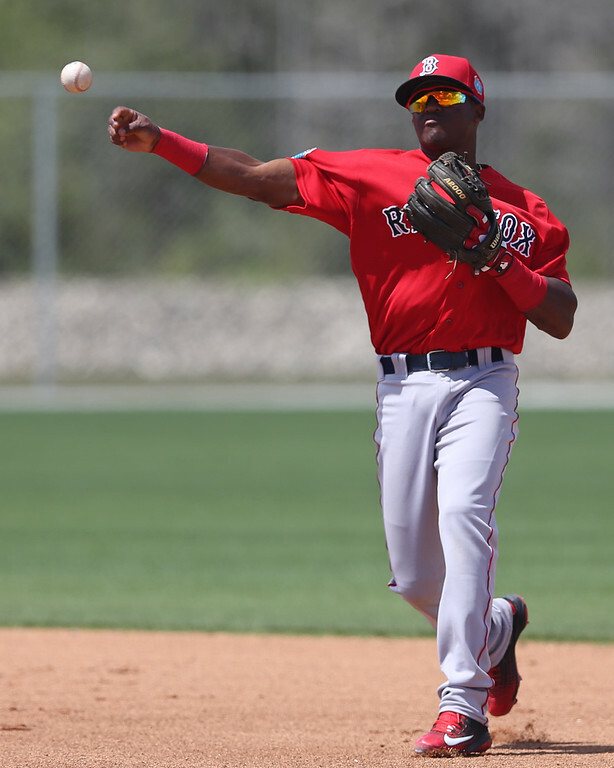 Luis Alexander Basabe has been turning heads and got lots of attention from the SoxProspects staff during spring training. Check out some of his spring training highlights here. 4/25 Cup of Coffee: It was a slow day offensively for the Red Sox minor league affiliates, with the exception of the Drive. Marco Hernandez had a great day at the plate for Pawtucket to back Sean O'Sullivan's 10-strikeout performance, despite losing. Justin Haley, Travis Lakins, and Logan Boyd each provided solid outings on the bump, and Tate Matheny, Joseph Monge, and Josh Ockimey paced Greenville's offensive attack. After being silenced through six innings, the PawSox offense rallied with three runs in the seventh to tie the game, but the IronPigs would respond with two of their own to win the game. PawSox starter Sean O'Sullivan pitched well, throwing 7 1/3 innings, allowing four runs (three earned) on six hits, 10 strikeouts, and just one walk. Wesley Wright threw the remaining 1 1/3 innings and surrendered one run while striking out two. Marco Hernandez and Sandy Leon paced the PawSox offense, as they each went 3 for 4 with a double. Hernandez also stole his first base of the year. Cup of Coffee 4/23: The PawSox picked up the organization's only minor league win Friday, thanks to big contributions from Marco Hernandez and Ryan LaMarre (pictured). The Salem and Greenville offenses continued to produce despite losing efforts while Portland lost a game in which it allowed only two hits. Marco Hernandez’s RBI double in the seventh inning broke a 5-5 tie and proved to be the game-winner in the PawSox' eighth victory in nine games. Pawtucket did most of its damage in the bottom of the first, which saw nine batters come to the plate and five come across to score. After Deven Marrero and Blake Swihart set the table with singles, the PawSox built a lead with RBI doubles from Sam Travis and Ryan LaMarre and RBI singles from Chris Marrero and Mike Miller. The Red Wings managed to tie the game with runs in the fourth, fifth, and sixth, but after Hernandez’s decisive RBI, reliever Roman Mendez slammed the door with two scoreless frames. Aaron Wilkerson found mixed results in his first career Triple-A start. The 26-year-old righty looked sharp in his first three innings, but when the lineup turned over, the Rochester batters started to figure him out. He allowed seven hits and three earned runs in 4 2/3 innings. 4/21 Cup of Coffee: Pawtucket and Salem stayed hot, with each winning its seventh in a row thanks to strong efforts on the mound. Portland walked off as victors, squeezing out its second straight victory. Greenville played its longest contest in franchise history, but lost in heartbreaking fashion. Pawtucket won its seven straight thanks to a strong start from Robby Scott. The lefty tossed 4 1/3 frames, allowing just two hits while punching out five. Scott made the start on short notice after William Cuevas was called up to Boston. Jorge Marban picked up the win, allowing three hits and a walk over 2 2/3 innings. Wesley Wright notched his second save of the season, closing out the final two innings. With the game tied in the sixth, Sam Travis (pictured, right) laced a one-out double that brought home Deven Marrero and Rusney Castillo for the game's only offense. Travis has hit .452 during the PawSox' current road trip. After an outing in which he faced only four batters, the Red Sox have placed Joe Kelly on the 15-day disabled list. In a corresponding move, the team recalled Noe Ramirez from Triple-A Pawtucket. 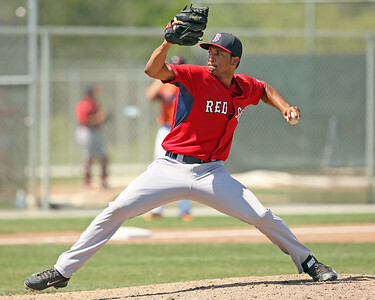 The Red Sox also selected William Cuevas (pictured) to the big league roster and optioned Marco Hernandez to Pawtucket. To make room on the 40-man roster for Cuevas, the Red Sox designated Edwin Escobar for assignment. Kelly walked two batters and recorded only two outs before leaving Tuesday night's game against the Rays with a right shoulder impingement. In 8 2/3 innings this season, Kelly has a 9.35 ERA with 10 walks and 11 strikeouts. PAWTUCKET, R.I. -- With Joe Kelly leaving Tuesday night’s game due to a right shoulder impingement, the starting pitching depth within the Red Sox system could be tested early. 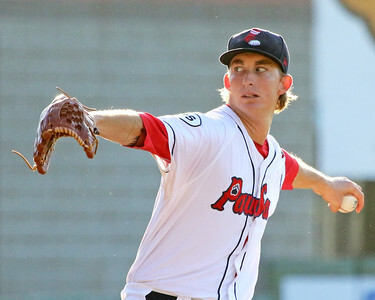 The Pawtucket rotation features three left-handed starters with varying levels of major league experience in Henry Owens, Brian Johnson, and Roenis Elias. I have had the chance to see both Owens and Johnson start this season and each showed why they are in consideration for the call-up, but also why there is not a clear top option at this point. - Owens started Opening Night in Pawtucket, throwing six innings while only giving up one hit and striking out eight hitters. However, Owens did walk three and his command and control were inconsistent, throwing only 55 strikes out of 92 pitches. It should be noted that it was very cold, with almost 20-mph wind during this start, so the conditions were not ideal. Hitters from both sides struggled, with only seven-combined hits and 30 strikeouts between the two teams. Owens has a tall pitcher’s frame, listed at 6-foot-6, 220 pounds. Though he has put on some weight since signing, his frame is still lean. At this point, however, he does not project to add significant weight, as he does not have the body type even with his height to support much more size. Owens delivery is controlled from a three-quarters arm slot, and with a high leg kick. He has natural deception in his delivery, with his arm coming through slowly and staying behind his body until he releases the ball. As a result of this deception, even though his fastball only touched 90 mph a few times, he was able to be effective and even get a few swing-and-misses with it. Throwing the pitch for strikes was a struggle a few times during the outing, as was commanding it within the strike zone, something that has been a concern with Owens since he joined the organization. 4/20 Cup of Coffee: Tuesday's action saw a continuation of the strong individual and team performances that have already become a hallmark of the 2016 season. 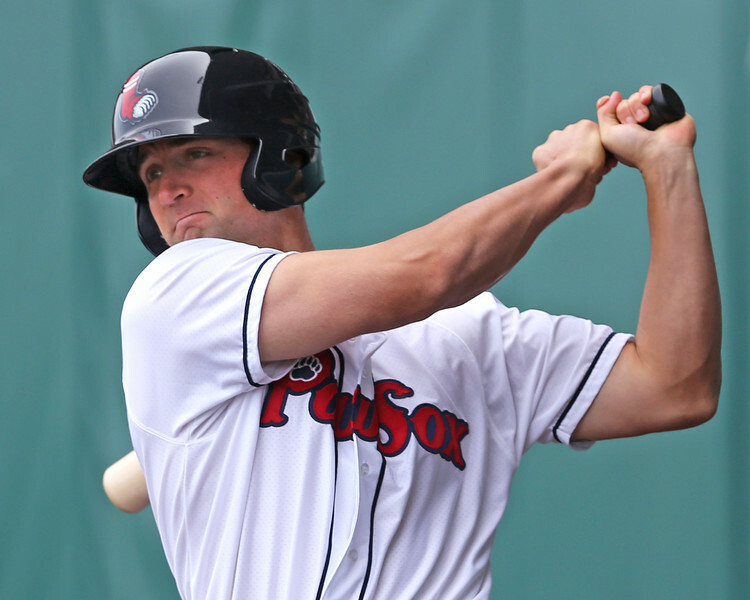 Youngster Sam Travis and veteran Sean O'Sullivan led the PawSox to their sixth straight victory. Every member of Greenville's lineup contributed in a 19-hit barrage as the Drive cruised to their fifth straight victory. Another strong outing from Kevin McAvoy paced Portland's win, while Salem's extra-innings win meant extra opportunities for Yoan Moncada (pictured) to show why he is on the shortlist of baseball's best prospects. In the midst of some roster shuffling, the PawSox have put together an impressive winning streak. 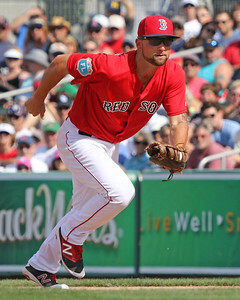 Keying their sixth-consecutive victory was first baseman Sam Travis, who went 4 for 5. As part of his third-straight multi-hit game, Travis had a double, two runs batted in, and three runs scored. 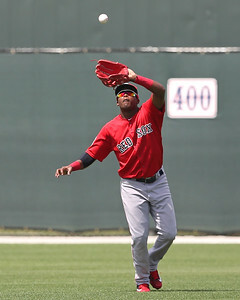 Getting a shot at some regular playing time seems to have invigorated Rusney Castillo, who went 2 for 5. Castillo is 8 for 21 since moving down to Pawtucket, having reached base in all five games. Justin Maxwell drove in three runs as part of a two-hit night, while Sean Coyle and Chris Marrero went deep for the PawSox. Sean O'Sullivan was solid in earning the win, giving up two runs on three hits in 6 2/3 innings. The big left-hander struck out five and walked only two. Roman Mendez allowed two runs in his 1 1/3 innings, before Pat Light closed out the win by striking out two in a perfect ninth. On occasion, we will be featuring videos here from the SoxProspects YouTube page. Today's video is of second-rated prospect Rafael Devers. Watch the 19-year-old field balls at third and show off his quick bat in batting practice down in spring training. Though Devers is off to a slow start in Salem this year, he is the third-youngest player in the league. This season, we plan to incorporate more video to supplement our regular scouting material, so check back here and on the YouTube page frequently. 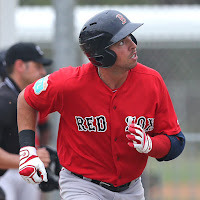 4/19 Cup of Coffee: The system's top prospects did not disappoint last night, as Henry Owens and Anderson Espinoza each had solid starts, while Yoan Moncada and Michael Chavis (pictured) had big nights at the plate. Blake Swihart and Rusney Castillo each played big roles in Pawtucket's victory, while the Greevnville offense erupted for 13 runs. The Pawtucket pitching staff put together a dominant performance, leading the team to an extra-innings victory. Henry Owens got the start, and his ERA rose to an even 1.00 on the season after allowing one run over six innings. He walked three, struck out nine, and allowed five hits, one of which was a solo home run. He now has 23 strikeouts this season to lead the Red Sox farm system. Edwin Escobar added a scoreless inning of relief, and Kyle Martin fired three perfect innings, striking out three. The biggest news of the week was the roster shuffling at the top of the system, with Christian Vazquez (pictured) and Marco Hernandez shipping up to Boston, and Blake Swihart and Rusney Castillo being optioned to Pawtucket. Vazquez was activated from the disabled list after spending less than a week rehabbing in Pawtucket. 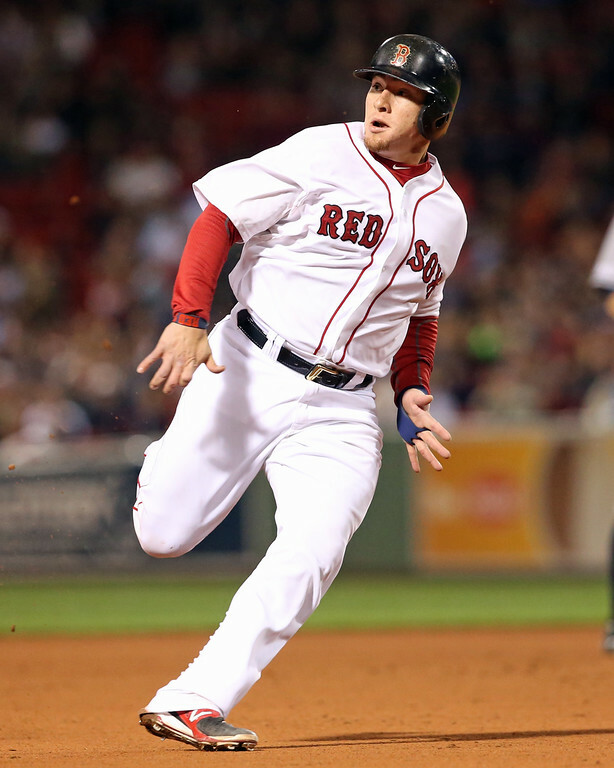 He made an immediate impact in Boston, going 2 for 4 while picking a runner off of first base in his first game back. While his arm is still not back to full strength after Tommy John surgery, his pitch framing seems to be. Alex Speier of the Boston Globe walked through three pitches from Friday night's game that show the impact Vazquez has behind the plate. 4/18 Cup of Coffee: Both Salem and Pawtucket rallied in the ninth inning to grab wins, with clutch hits from Sean Coyle and Yoan Moncada. Michael Chavis, Josh Ockimey, and Mitchell Gunsolus had huge days at the plate for Greenville. Aaron Wilkerson pitched well again, and 2015 sixteenth round pick Marc Brakeman made his 2016 debut for the Drive. The PawSox used a dramatic ninth inning to pull away with a win. Sean Coyle came through with a two-run single in the inning to break a 4-4 tie. Chris Marrero tied the game with a sacrifice fly to score Blake Swihart who doubled to lead off the ninth. 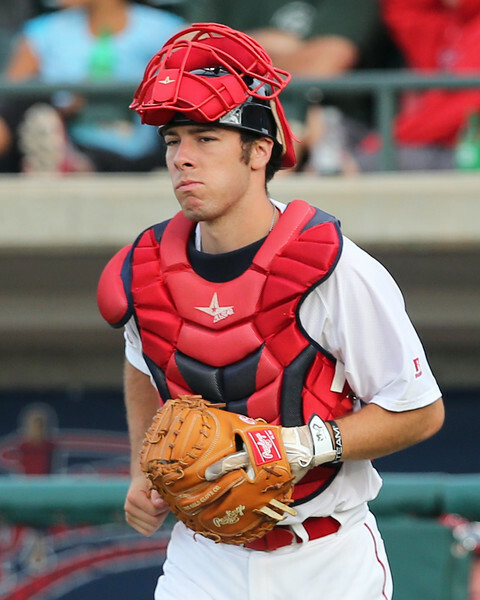 Swihart finished 1 for 5 in his first Triple-A game this year. Deven Marrero had a huge game in the leadoff spot, reaching in 5 of 6 plate appearances with three hits and two walks. Rusney Castillo and Sam Travis each went 2 for 4 with an RBI. Roenis Elias delivered a decent outing, lasting 5 2/3 innings while allowing two earned runs on seven hits, three walks, and five strikeouts. Jorge Marban tossed 1 1/3 innings of shutout ball despite three walks. Anthony Varvaro blew the save after allowing two runs in the eighth inning, but Wesley Wright shut the door in the ninth after Pawtucket's rally. PAWTUCKET, R.I. -- Sam Travis has seemingly one focus: Winning. Whether discussing his promotion to Double-A last season, success in the Arizona Fall League, or even spring training, Travis brings the focus back to winning games. In an environment where more stress is put on personal development and working towards your next promotion, his borderline obsession with winning stands out among his peers. Coming off a strong first full season in Salem and Portland, a successful spring campaign with the major league team has now landed him on the doorstep of the place where winning is the only goal. Baseball is back! Minor League games went underway on Thursday, meaning the four full-season Red Sox affiliates are back in action. 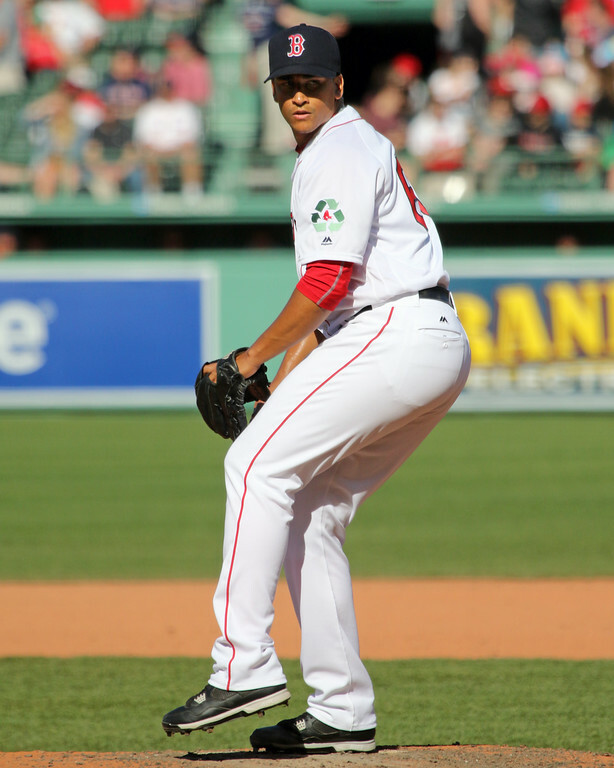 The Cup of Coffee is back for another season at SoxProspects.com, so be sure to check our daily recaps on each game. 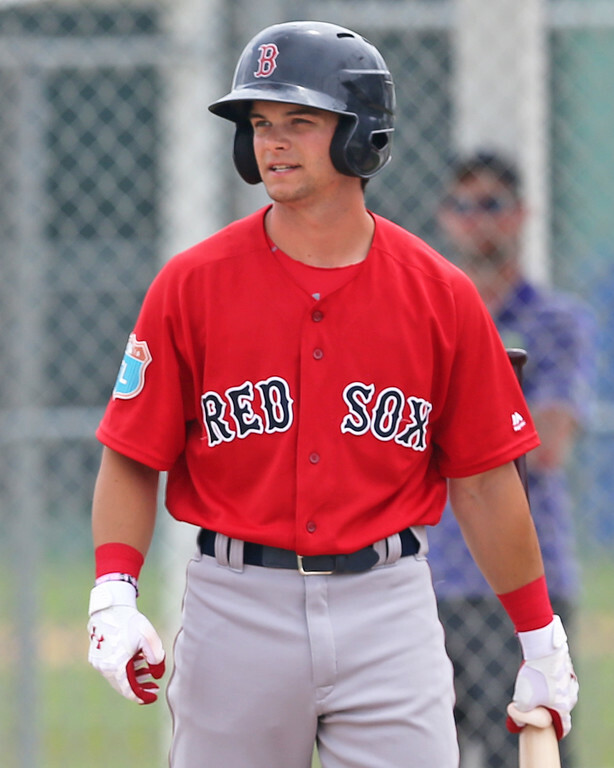 Andrew Benintendi (pictured), ranked fourth at SoxProspects.com, got off to a blistering start for a loaded Salem Red Sox team, going 4 for 5 with a double and a triple. Teenage sensation Anderson Espinoza also made his much-anticipated debut for the Greenville Drive and allowed just two base hits in five scoreless frames. Espinoza seems very driven this season, stating that he would like to end the year with Portland. 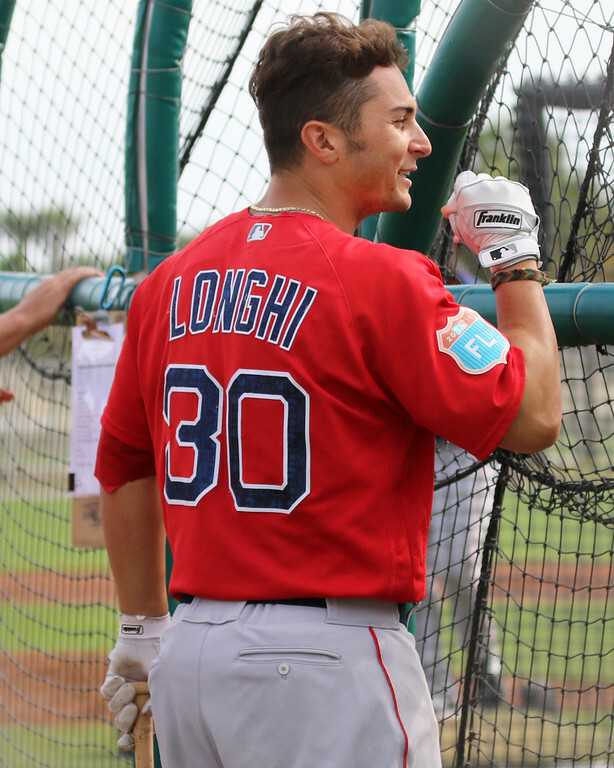 Some terrific video was gathered by the SoxProspects.com crew during their trip to Fort Myers, including some up-close looks at top-ranked prospect Yoan Moncada and Benintendi. 4/11 Cup of Coffee: Portland and Salem both played extra-inning games, with the Sea Dogs playing 13 innings and Salem playing 11 in the first game of a twin bill. Teddy Stankiewicz, Jalen Beeks, and Roniel Raudes all threw very well in their respective debuts. Luis Alexander Basabe had a big day at the dish for Greenville and Rafael Devers smoked his first home run of 2016. After breezing through the first two innings, PawSox starter William Cuevas hit trouble in the third, allowing four runs. He ended up taking the loss after five innings of work, allowing six runs (five earned) on five hits and three walks, while striking out four. Right-hander Jorge Marban tossed two shutout innings in his season debut, punching out two and not allowing a hit. Pat Light also made his first appearance of the season and struggled, allowing two runs, including a home run, and two walks in his only inning of work. Kyle Martin pitched the ninth inning and struck out three, but allowed three hits and a run. The Pawtucket offense was stymied for most of the day. Designated hitter Christian Vazquez was one of the few bright spots, going 3 for 4 with an RBI. He is now 6 for 9 with three walks on the young season. Left fielder Allen Craig added a double and a walk. Check out SoxProspects.com's Managing Editor Matt Huegel's twitter feed for some more details on the loss. 4/10 Cup of Coffee: It was a day of rescheduling across the Red Sox' system as the Triple-A Pawtucket Red Sox played a double-header and the High-A Salem Red Sox were rained out. 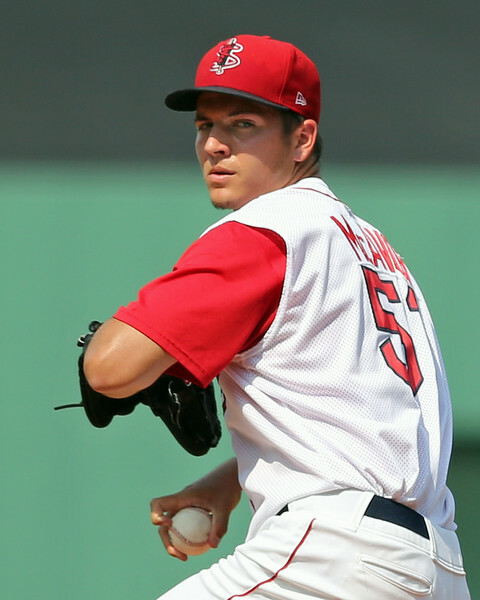 Pitching shined amongst Red Sox affiliates, highlighted by strong performances by Sean O'Sullivan (Pawtucket), Kevin McAvoy (Portland), and Logan Boyd (Greenville). There were also some excellent offensive outings, most notably from Luis Alejandro Basabe (pictured) and Marco Hernandez. This game was the makeup for the PawSox' opener, which was rained out Thursday. Sean O'Sullivan was on the mound and provided a boost, submitting a complete-game performance (seven innings) and allowing three runs while striking out eight and walking none. Unfortunately, the PawSox offense was silent, managing one run. 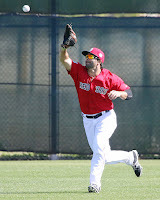 Left fielder Chris Marrero drove in first baseman Sam Travis in the fourth with a single. Pawtucket batters had only four hits for the game and struck out nine times. David Aardsma (TOR), who pitched out of Boston's bullpen in 2008, picked up the save for Buffalo. 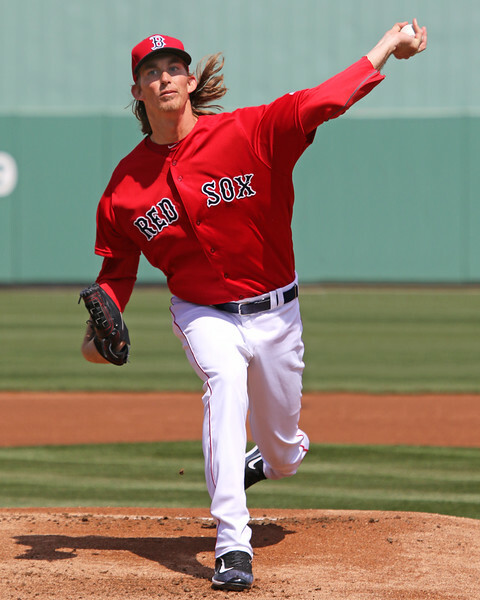 4/9 Cup of Coffee: Left-handed pitcher Henry Owens (pictured) jump-started the Triple-A Pawtucket Red Sox season with six shutout innings in a 2-0 victory, and right-handed pitcher Anderson Espinoza picked up where he left off last season with a dominant start in Low-A Greenville. While the PawSox were the lone affiliate to pick up a win Sunday, corner infielders Jantzen Witte (Portland), Nick Longhi (Salem) and Michael Chavis (Greenville) turned in impressive performances at the plate. 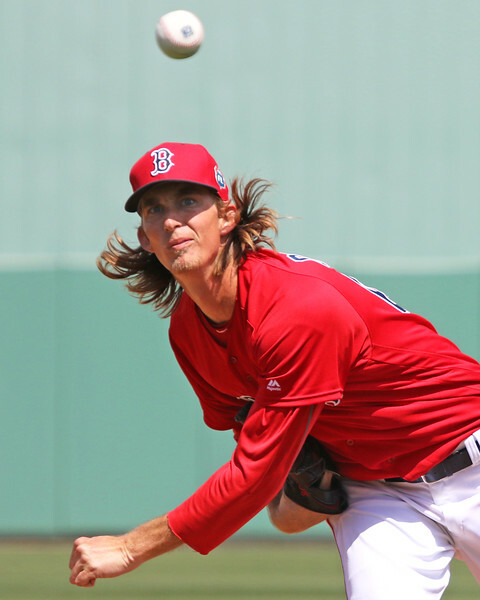 After ending 2015 with 11 big-league starts, Henry Owens’ return to Triple-A was a smooth one. Owens allowed only one hit and three walks in six scoreless innings, striking out seven Bisons. A Sean Coyle home run and an Allen Craig RBI double were all the PawSox needed, as the bullpen completed the shutout. Christian Vazquez started his return from Tommy John surgery with an encouraging 1-for-2 night with a double and two walks. On occasion, we will be featuring videos here from the SoxProspects YouTube page. 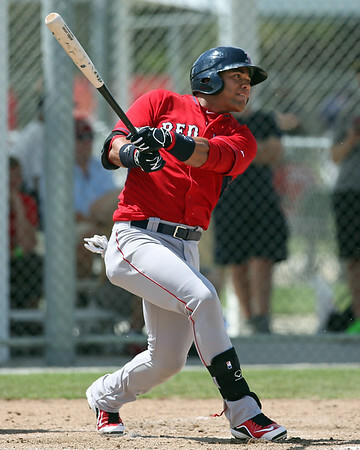 Today's video is of Red Sox top prospect Yoan Moncada. Watch the 20-year-old take cuts in batting practice as well as spring game action from both sides of the plate, including against Rays starter Jake Odorizzi, as our scouting staff wrote up. In addition, you can get a look at his defensive chops in drills. This season, we plan to incorporate more video to supplement our regular scouting material, so check back here and on the YouTube page frequently. For now, enjoy this extended look at the impressive Cuban second baseman. 4/8 Cup of Coffee: Welcome back for another season of Red Sox minor league game recaps with the SoxProspects.com Cup of Coffee. 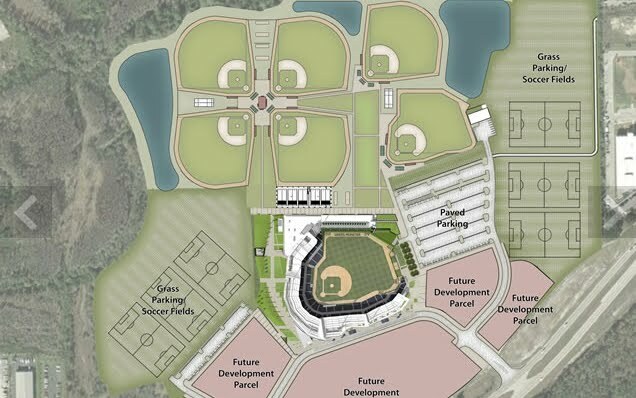 Many followers of Boston's system have been eager to see how the offense that pounded the ball in Greenville last season would fare upon their promotion to Salem. 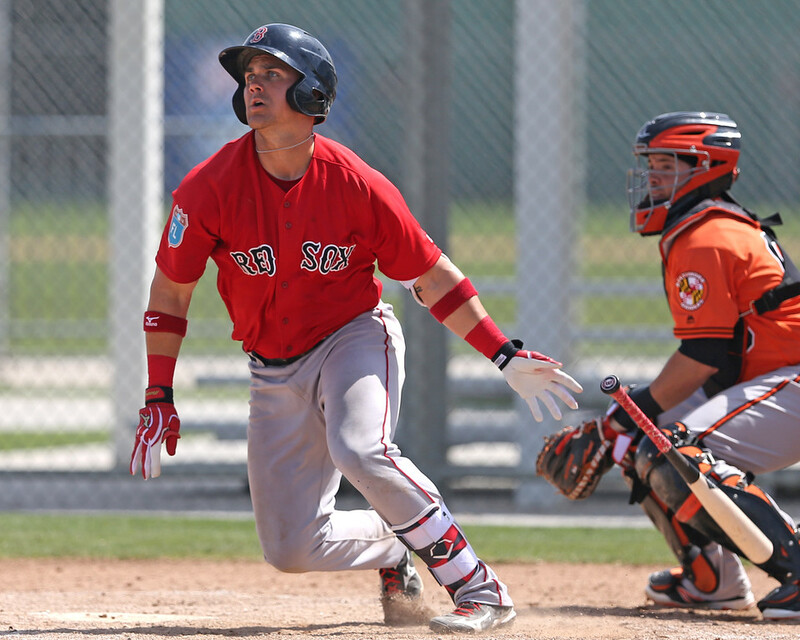 They did not disappoint in the Salem opener, with Andrew Benintendi (pictured) and Yoan Moncada leading the charge in an offensive explosion for the High-A Red Sox. The three teams that played received great Opening Day outings from their starters, including quality outings from Aaron Wilkerson (Portland), Daniel McGrath (Salem), and Matt Kent (Greenville). 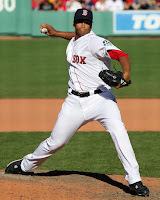 Pawtucket Red Sox vs. Buffalo Bisons (TOR) - PPD. The PawSox, like the big club, will have to wait an extra day for their season to start as rain plagued Pawtucket and most of New England on Thursday. According to a team release, Pawtucket will play its opener on Friday at 6:15 with pregame ceremonies starting at 5:45. The two teams will play a doubleheader on Saturday. On occasion, we will be featuring videos here from the SoxProspects YouTube page. 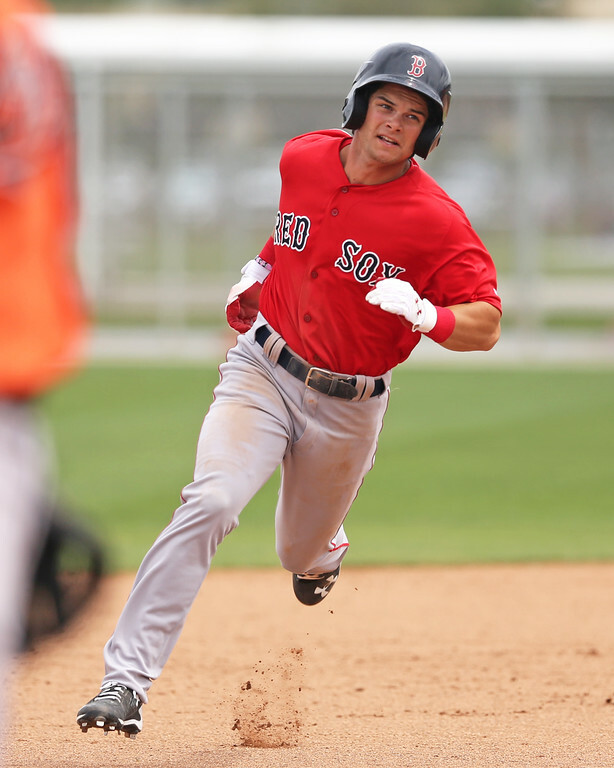 Today's video is of 2015 first-round draft pick Andrew Benintendi. Watch last year's college player of the year unleash his smooth swing in batting practice as well as minor league spring training game action. This season, we plan to incorporate more video to supplement our regular scouting material, so check back here and on the YouTube page frequently. For now, enjoy watching Benintendi's swing, and happy Opening Day! The Triple-A Pawtucket Red Sox will enter the 2016 season with a roster full of big league experience and a handful of prospects. Nine PawSox have already exceeded rookie limits in the MLB, while four of five starting pitchers and seven of nine likely starting position players have already made their major league debut. 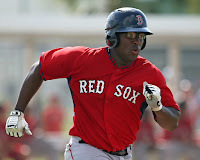 That said, the squad will feature some top prospects, including five players ranked in the top-20 on SoxProspects.com. A few members of the PawSox may well make their mark in Boston before season's end. 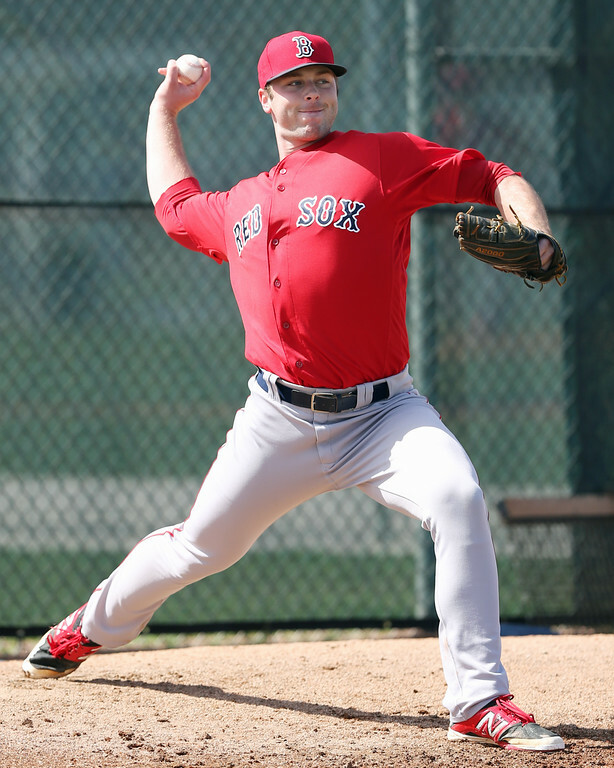 Left-handed pitchers Henry Owens and Roenis Elias competed for the fifth spot in Boston’s starting rotation during Spring Training, but lost it to Steven Wright. Catcher Christian Vazquez is expected to join the PawSox at the beginning of the season. He captured a starting role with the Red Sox in 2014 before Tommy John surgery sidelined him last season. He will start in Triple-A in attempts of returning to form. 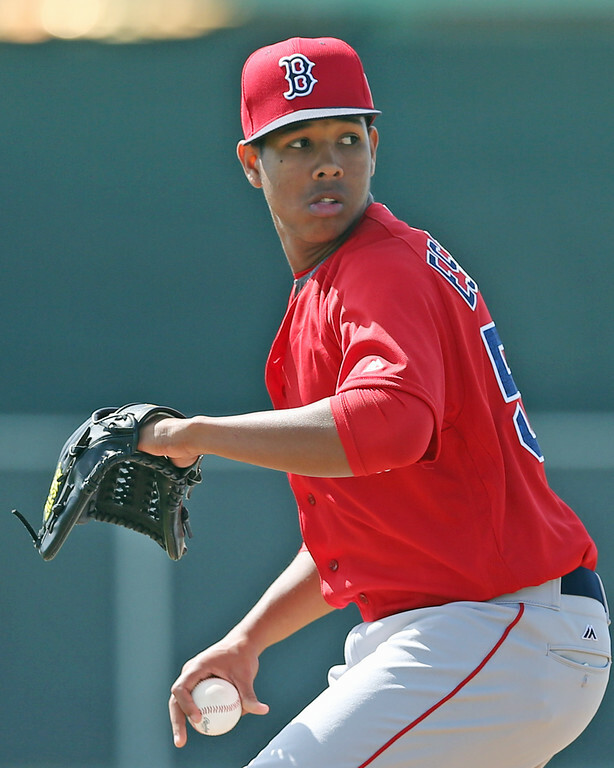 The Double-A Portland Red Sox announced their initial 2016 roster today, led by two top 20 prospects in the bullpen. The Sea Dogs only have three players who rank in the top 20 according to SoxProspects.com, Williams Jerez (pictured, right), Luis Ysla, and Wendell Rijo. 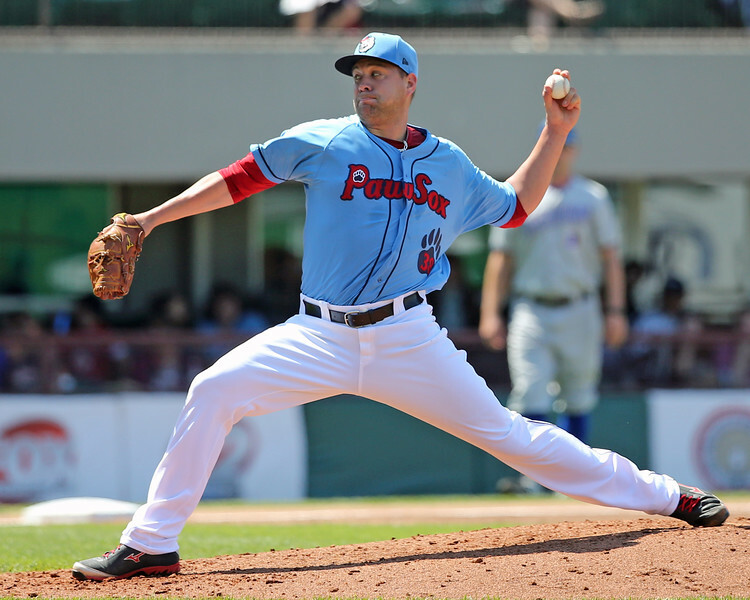 Jerez returns to Portland after finishing the 2015 season at the Double-A level, where he compiled a 3.65 ERA in 22 relief appearances. Ysla, acquired in a late season trade with San Francisco, will make his Sea Dogs debut after spending last season transitioning from starter to reliever with High-A San Jose (SF). At the plate, Portland will be led by Rijo, who spent all of 2015 with High-A Salem, collecting 27 doubles and six home runs as a 19-year-old. Henry Ramos will return to Portland, looking to finally be healthy after coming back last season from a injury in 2014 that caused him to miss significant time. Also returning to Portland will be Tim Roberson, who showed promise last season, hitting .300 in 57 games last season with the Sea Dogs. The Low-A Greenville Drive announced their roster today, headlined by three prospects ranked in the SoxProspects.com top 20. Right-handed pitcher Anderson Espinoza (pictured), ranked third in the system and making his full-season debut, is far and away the best prospect of the group. The 18-year-old phenom cruised through the Dominican Summer League and Gulf Coast League last season. He even made one start for Greenville in September, giving up three earned runs in 3 1/3 innings. With an excellent repertoire and an advanced feel for pitching, the Red Sox hope he'll make quick work of the the South Atlantic League as well. The Greenville lineup doesn't quite have the strength of last season, when they sported one of the most talent-rich rosters in the minors. 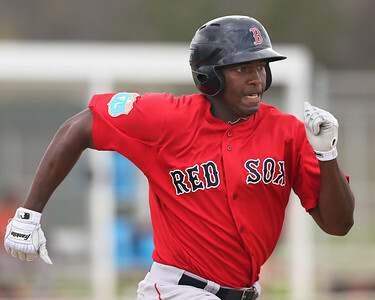 However, Luis Alexander Basabe and third baseman Michael Chavis, a holdover from last year's team, rank eighth and tenth, respectively, in the SoxProspects.com rankings. While both have had some trouble making consistent contact, they will inject some power for the Drive, with Basabe providing quality center-field defense to boot. The High-A Salem Red Sox announced their initial 2016 roster today, led by three of the top five prospects in the Red Sox' system. 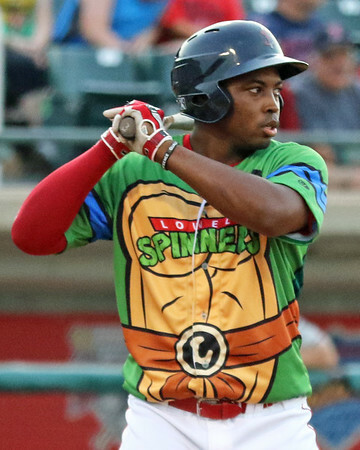 The prospect holding the top slot on SoxProspects.com, Yoan Moncada (pictured), will enter his second professional season after having a superb debut in 81 games last year for Greenville. One of the top prospects in all of baseball, Moncada will look to continue refining his craft in the Carolina League. 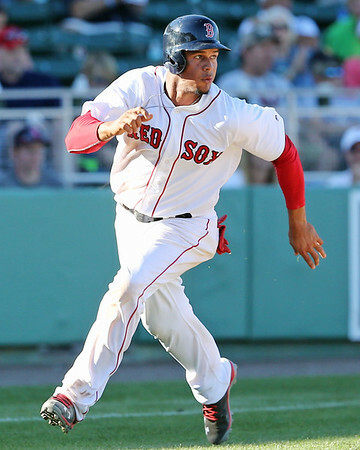 Besides Moncada, the Red Sox' lineup includes second-ranked prospect Rafael Devers and No. 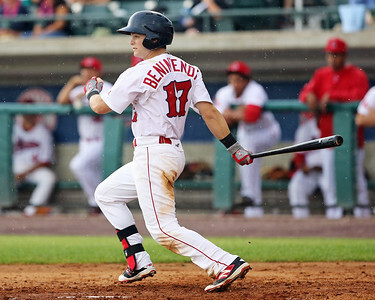 4 prospect Andrew Benintendi. 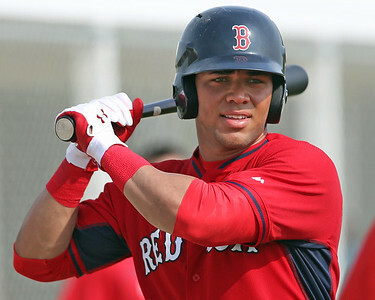 Devers, a third baseman, showed impressive pop in Greenville last season, with 11 home runs and 38 doubles in 115 games. Benintendi, an outfielder and the Red Sox' first-round selection in the 2015 draft, quickly impressed with both Lowell and Greenville. The three top prospects will look to lead a talented lineup that also includes 2015 South Atlantic League All-Star Mauricio Dubon, and Nick Longhi, who is coming off a solid season with Greenville. Salem's rotation will be lead by a pair of 2015 draftees, Travis Lakins and Ben Taylor. Daniel McGrath will return to Salem after posting a solid a 3.84 ERA in 17 starts last season. The Red Sox bullpen features a number of intriguing arms looking to put together strong seasons, including Mario Alcantara, Jamie Callahan, Austin Maddox, and Taylor Grover. The SoxProspects.com community has voted for its 2016 Pre-Season All-Stars at each position. Here are the players who are expected to have the best season in the Red Sox minor league system at their respective positions, ideally not taking prospect status into consideration. Though Rei struggled in his professional debut, both he and the SoxProspects community are optimistic about his chances to improve this season. Rei tore a ligament in his thumb during his junior season at the University of Washington, and he was not quite right when he returned to the field later that season. After the Red Sox made him a third-round draft pick, Rei hit a meager .179/.285/.295 with Lowell in 2015 and struggled to make defensive adjustments. However, he still has a reputation as a strong defensive catcher, and he hit well during his collegiate career, suggesting that better days could be coming in his first full professional season.